If you’re a runner, chances are you’ve heard such cautionary advice one too many times. 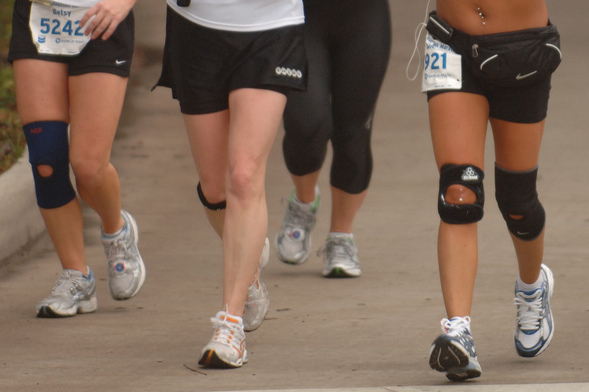 For the 42% of runners who suffer from knee injuries each year 1, chronic, and potentially debilitating knee pain may be a legitimate concern. For others, the threat of knee problems pales in comparison to persistent foot or ankle injuries. Although knee and ankle injuries are among the top afflictions that runners suffer 1, it’s unclear what predisposes individuals to these distinct injury patterns. Research points to a host of factors that contribute to running injuries, including structural imbalances, biomechanical errors, poor diet or stress, to name just a few. Given recent reports that foot-strike patterns correlate with impact forces and injury rates 2,3, increasing attention has been paid to foot-strike modifications as a potential tool for injury prevention. In their recent study 4, a group of researchers from Finland tested the relationship between rearfoot or forefoot striking and measures of force and stress on the knee and ankle. The scientists sampled a large pool of athletes (286) to identify 19 female rearfoot and 19 female forefoot strikers who were carefully matched on critical features including age, weight, height and lower limb strength and structure. Gait analysis, involving collection of kinematic data at the knee and ankle, was performed while participants ran along a 15-meter track. Together these findings indicate that the different foot-strike patterns oppositely mediate stress at the knee and ankle. Specifically, they suggest that a forefoot strike reduces force and stress to the knee joint, and minimizes potentially detrimental knee motion – a promising finding for any runner suffering from knee pain. Shifting from a rearfoot to a forefoot (or possibly midfoot) strike may be an easy adaptation to mitigate excessive stress to the knee. However, gait modifications don’t always cause forces to simply disappear, but rather, can redistribute them. Hence, adopting a forefoot strike may also come with a cost; namely, increased stress to the foot or ankle, as observed here. Greater ankle involvement during forefoot striking may elevate risk of foot and ankle stress injuries such as Achilles tendinopathy, plantar fasciitis or metatarsal stress fractures. These findings argue that both foot-strikes carry unique sets of risks and benefits. Yet, the researchers observed additional features in the forefoot strikers – lower impact forces and loading rates, shorter contact times and landing closer to their center-of-mass – which may afford greater protection against injury 5. However, most running injuries are repeated stress injuries, and the authors caution that the relationship between between stress intensity and frequency is unclear. A high cadence (i.e. greater step frequency) with less loading per step could feasibly be as detrimental as a low cadence with higher loading. A notable strength of this study was its design. While the sample population was highly homogeneous, the athletes were meticulously matched to rule out several critical confounds. Furthermore, the runners were tested not only using their natural foot-strikes, but also in a standard shoe (presumably their normal shoe). These features minimize concern that forcing participants to run in an unnatural state might influence the results. That said, additional research is needed to extrapolate these findings to other athlete populations, and directly examine the efficacy of modifying one’s preferred foot-strike for injury prevention. Furthermore, the jury is still out on how joint forces, loading rates and impact forces influence injury acquisition. There is some indication that some of these factors may be more injurious to tissue, but the causal relationship is still being delineated. For decades, runners have been asking “What’s the right way to run?” While this study does not offer a black-and-white answer, it does add support to growing evidence that distinct gait patterns are associated with distinct stress patterns. The next step is to test how – or if – these differences translate into unique injury profiles. Yet again, we see there’s probably no one right way to run. But there may be a better way for you, depending on your goals and injury history. Taunton J et al. 2002. A retrospective case-control analysis of 2002 running injuries. Br J Sports Med. 36:95-101. Tags: ankle injury, footstrike, patellofemoral pain, runner's knee, running, running form, running injury. Bookmark the permalink. Previous post ← Cool shirt. But can it stand the heat? This is really informative! Thanks for sharing! Cool shirt. But can it stand the heat?